Tehran, Oct 30 (IANS) Iran has not stopped building missiles and has no intention of doing so, said President Hassan Rouhani. 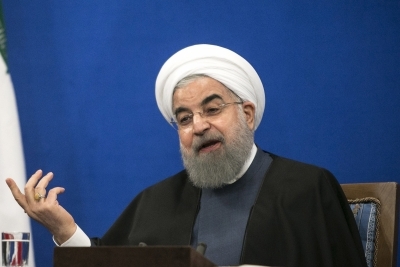 Rouhani’s remarks came on Sunday, three days after the US House of Representatives approved legislation that would impose new sanctions on Tehran for pursuing long-range ballistic missiles, the Los Angeles Times reported. In a speech carried on nationwide television, Rouhani insisted that no international agreements prohibit the development of such non-nuclear weapons, and that Iran has a right to produce them for its own defence. “We will build, produce and store any weapon of any kind we need to defend ourselves, our territorial integrity and our nation, and we will not hesitate about it,” he said, according to a translation provided by the Iranian Students News Agency. Several times in the speech, Rouhani took aim at the US for what he called its “shaky” commitment to the nuclear deal negotiated under the Obama administration. US President Donald Trump has consistently attacked the deal, and recently refused to certify that Iran is living up to its end, although he did not pull out of the agreement as he has threatened to do. “The administration of a country that abandons international commitments of the previous administration is not reliable,” the Iranian leader said. In negotiating and signing the nuclear deal with the US, Rouhani frequently clashed with more conservative forces in Iran who opposed any cessation of the country’s nuclear weapons program. But there is near unanimity across the political spectrum in Iran on maintaining a robust missile program. Hamid Reza Taraghi, an influential conservative politician who is close to Iran’s supreme leader, Ayatollah Ali Khamenei, agreed.